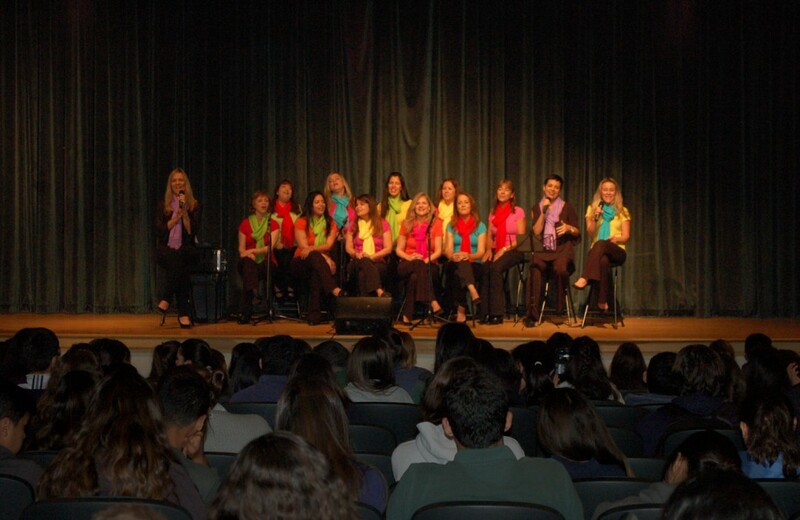 On March 17, 2015, at 9:00 am, Brazilian Voices had the privilege of presenting its Culture and Education Program “A Little Bit About Brazil” at the Ronald Reagan Doral Senior High School. The program, which is a compact version of the acclaimed “From Brazil to the World”, has already been presented with great success in small venues, such as other schools and museums. Students from Mrs. Beatriz Cariello’s Portuguese class were among the selected group of 500 who attended the performance at the school auditorium. The audience embarked with great enthusiasm on the interactive journey through Brazilian rhythms, music and culture. Participants learned basic facts about Brazilian culture while being exposed to a variety of styles such as Forró, Baião, Brazilian jazz or Bossa Nova, Samba, and Rock. The students joined Brazilian Voices by singing a widely recognized song and by performing a “batucada de boca”, a vocal percussion samba experiment.